This topic introduces a simple Continuous Integration pipeline based on GitLab CI/CD. Although we keep it simple now, this pipeline will be extended in the next topic. This topic is based on a simple web application written on top of Spring Boot (for the backend) and React (for the frontend). The file organization shows a way to combine backend and frontend code into a single module (to keep it simple). The backend is stateless, which means that it does not store any data (for example, no shared variable in the code). Instead, the data is saved in a database. This architecture is particularly useful for horizontal scaling. Because a relational database is involved, this project demonstrates how to use Flyway to help to upgrade the schema when the application evolves. The build process involves Npm, Babel, Webpack and Maven to compile and package the application for production. Code quality is achieved thanks to SonarQube, a tool that can detect bugs in the code and help us to maintain the project over time. Click New… from the top (with a + icon) and select New project. In your GitLab web browser tab, click your avatar (top-right of the page) and select Settings. Click SSH Keys from the left. Copy the result of the cat command and paste in the Key field (in the GitLab web browser tab). 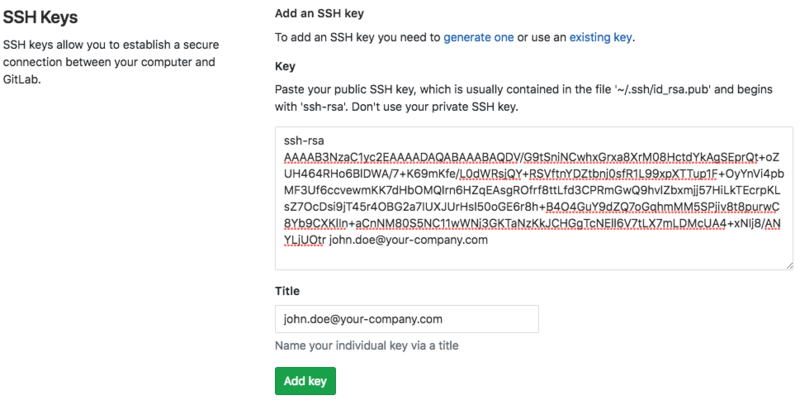 Click Add key to register your SSH key. git config --global user.email "john.doe@your-company.com"
.git: Folder containing information for git. .gitignore: List of files to ignore for Git. .gitlab-ci.yml: GitLab CI pipeline configuration (more information about this file later). package.json: Npm configuration for the frontend: it declares dependencies such as React, Babel and Webpack. pom.xml: Maven configuration for the backend: it declares dependencies, how to compile the code, how to run the tests, and how to package the complete application. src: Source code of the application. src/main/java: Backend code in Java. The entry-point is com/alibaba/intl/todolist/Application.java. src/main/js: Frontend code. The entry-point is app.js. src/main/resources/application.properties: Backend configuration (for example, database url). src/main/resources/db/migration: Database scripts for Flyway (more on this later). This command should end with a BUILD SUCCESS message: it compiles and runs the tests and packages the application. The application source code organization is based on this tutorial. You can read this document if you are interested in HATEOAS, WebSockets and Spring Security. Although the application needs a database, the tests pass because they use H2, an in-memory database. Download and install MySQL Community Server v5.7. Note that it will normally give you a temporary root password. The spring.datasource.url property is in the format jdbc:mysql://HOSTNAME:PORT/DATABASE_NAME?useSSL=false. If you modified this file you need to re-run mvn clean package. Note You can add new tasks by filling a description and by clicking Add. Congratulation if you managed to get the application up and running! The source code has been written with the IntelliJ IDEA IDE (the ultimate edition is necessary for frontend development, you can evaluate it for free for 30 days). The flyway_schema_history table has been created by Flyway, a tool that allows us to create and update our database schema. As you can see, the table contains the names of the scripts from src/main/resources/db/migration that have been successfully executed. During the development of the application, when we want to upgrade our database schema, we need to add a new script in the src/main/resources/db/migration folder with a higher prefix number (we cannot modify existing scripts). When Flyway starts, it checks what are the scripts that have been already executed (thanks to the flyway_schema_history table), and run the new ones. Flyway is automatically started when the applications starts, if you check the application logs, you can see that Spring calls Flyway during its initialization. For more information about this integration, please read the official documentation. Click Projects from the top and select Your projects. 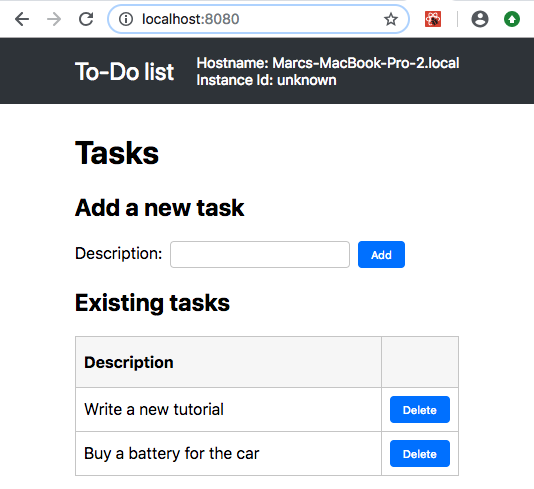 Click the todolist project to see your files. Click CI / CD from the left and select Pipelines. Clicking Artifacts on the left allows you to download the generated .jar file containing your ready-for-production application. Clicking the icon in the Stages column and then selecting build allows you to see the commands and logs used to compile and package the application. The first line image: maven:3.6.0-jdk-8 defines the Docker image used to execute the build command (as you can see, using Docker relieves us to setup the JDK 8 and Maven on the GitLab runner manually). The MAVEN_OPTS variable and the cache block are an optimization: because Maven takes a lot of time to download dependencies, these definitions allow us to re-use these dependencies among pipelines. The stages block defines only one stage build, we will add new ones later in this tutorial. The build block is the most important one: it instructs the GitLab runner to execute mvn package in order to compile and run the tests and package the application. The artifacts block instructs GitLab to save the generated .jar file. Note Even if this pipeline is simple, it is already quite useful for a team since it can immediately inform the team that somebody committed something bad (for example he missed a file, or some test fail unexpectedly). GitLab automatically sends an email to the person who made the mistake: this rapid feedback can save us a lot of time because the error cause has a great chance to be located in the code that we just modified.